‘NEVER EVER compare the edited, digitally enhanced, carefully presented highlights of someone else’s life with the broken, wonky, slightly unhinged or painful reality that you know to be your own. Don’t ever look at ‘other people’ and think ‘wow, they’ve got it all together, their lives are so blessed, calm, productive, balanced…. (or whatever)’. And please, don’t ever think that way of ME! (You weren’t? Oh, that’s kind of disappointing). When you look at someone with envy, or feel intimdated by their success, firstly you need to ask yourself ‘what hole in me is turning appropriate admiration into ugly competativeness?’ Secondly you need to remind yourself that the chances are you do not know their inside story. Here is some of my current inside story: I’ve been awake at 5 am most mornings this week, stressed to the eyeballs over lists of things to do, have let down at least two groups of people and am busy pretending I’m not worrying about a long stint away from home. And that’s just some of the inside stuff!! I’m not telling you any more. I’m laughing ruefully because I’m also currently reading two very good books about ’emotional health’ of which more in a moment. ‘We had a great time at church’ (NTFS: ‘we had a row on the way there and I got really stressy’). Okay, I know these are a bit extreme and I must stress they are fictional but does anyone else ever get the feeling that sometimes someone telling me something has a hidden message, and the hidden message in the thing they are saying is ‘Jesus loves me more than he loves you’. ‘Marvellous me’ moments, I call them. I’m so wary of them, I’d rather tell you about something stupid I did than tell you my acheivements. Although I do post up ‘success’ stories (and ‘why not publicise a good news story?’ I rationalise) I think it’s important to bear in mind that there might be a ‘back room’ angle on the story that I can’t always tell you. Sometimes the reason for this is because the ‘real’ story is about my own fears, failures, confusions, uncertainties, doubts and inner wobbles (and I’m as tempted by ‘impression management’ as the next person) but sometimes I can’t tell you the back room story because it’s a story about the people who drive me bonkers, let me down or otherwise ‘do my head in’ AND these are people I am called to love (and NO, I’m not thinking of YOU! Stop being paranoid. Well okay, may be I am thinking of you….! See? That’s why none of us can ever tell our whole story in a public way, people will get hurt). You have your ‘stuff’ that only you know about (disappointments, fears, broken relationships, hang overs from childhood, hiccups in your ability to show love even to those closest to you) and other people have theirs. You are not alone. 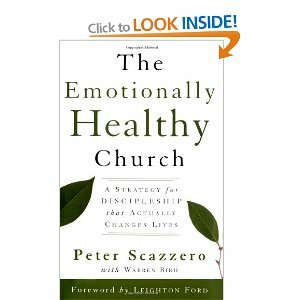 I’ve been thinking hard about all this ‘inner stuff’ because of these books I have come across by a guy called Pete Scazzero Emotionally Healthy Spirituality and Emotionally Healthy Churches. His basic premise is that you can ‘do’ all the spiritual disciplines you like but if you have not taken a long hard look below the surface of your life you will not be emotionally healthy. Your relationships in the present will still be mostly dictated by your past, by the hurts and habits of your family of origen, unless you have examined these. Then he writes about living in brokeness and vulnerablity, accepting the gift of your limits and embracing the grief and loss in your life. I realise none of that sounds too cheerful but honesty really is the best policy and the point of this process is to acheive an emotional maturity that enables us to love well (althought I have to wince at the word ‘acheive’ because emotionally healthy people do not waste any time telling you how marvellous they are, because they know they are not marvellous, they are simply learning to live comfortably with their own ‘back room’ story). These are really, really good books. I totally recommend them. They say much the same thing as Larry Crabb did about 25 years ago in his book Inside Out which up until now has been the book that’s had the greatest impact on my life. But Crabb wrote as a ‘clever’ Christian psychologist, it was not an easy read. Pete Scazzero writes as a broken, vulnerable and very real pastor. It’s very readable and wont make you feel intimidated. One of my favourite sayings is ‘Be Kind for everyone you meet is fighting a hard battle’ (Plato – allegedly) but sometimes that ‘hard battle’ is so well concealed you’d hard know. They may be in denial but never doubt that it’s there, so ‘be kind’. The point of these books is to help you do that: the more you have dealt with your own ‘stuff’, the better you will be able to tolerate and even love others with their ‘stuff’ whether or not they admit their flaws. Watt Bike Workout – Wheely Wonderful! When I have blogged or commented about my breakdown and attempted suicide people tell me I’m brave but, as you say, there is much more going on underneath that you can’t say in case you hurt people. My pain over the last year has been caused by a church situation and I have steadfastly avoided commenting in blogs, Facebook etc as it didn’t feel right. However I did end up communicating with a woman in Seattle who was going through a similar experience at the same time and we were able to share what was happening and support each other. I can’t even remember who directed me to one of her blogs in the first place (it may have been Maggi Dawn – it usually is) but I can only describe our friendship as miraculous. Do remember you are held in prayer by more people than you realise.